Located in North Texas, the Longhorn wind farm is comprised of 100 Vestas V100/2000 turbines with a unit capacity of 2 MW, for a total installed capacity of 200 MW. 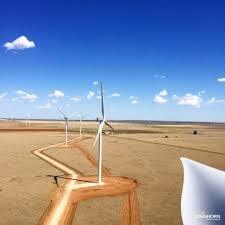 Output from the Longhorn wind farm is equivalent to the annual electricity consumption of around 55,000 Texas homes. The Longhorn wind farm is tied into the transmission line (CREZ) connecting the wind energy of northern Texas to high-consumptinon regions of the state. Electricty produced is sold via the local power market. This project was built together with RES Americas, which agreed on giving it up to EDF EN, after having achieved the project.